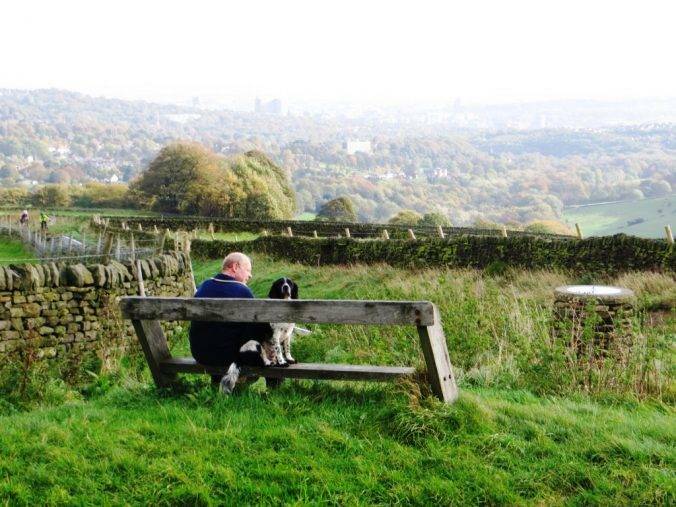 This is a simply unbelievable walk that propels you onwards and downwards from the ruggedness of the moors to the heart of Sheffield in seven gripping miles of stream-side rambling and culvert hugging. 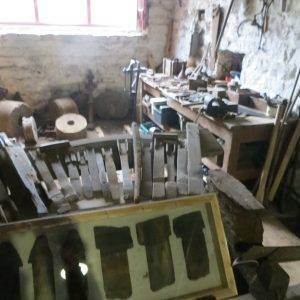 During the 19th century, Sheffield became pre-eminent in steel production, especially cutlery. The crucible technique of making exceptionally high-quality steel was invented here by Benjamin Huntsman in 1852, and for decades it gave Sheffield the economic advantage over other steel producing cities. This, and other local innovations, fuelled an almost tenfold increase in the population within a hundred years. But from being one of the north’s wealthiest and most successful cities, it was battered in the 70s by the decline in British steelmaking and the collapse of coal mining in the area. It was not until the new millennium that extensive redevelopment got under way, with steady economic growth and new service-based industries including hi-tec locating here. 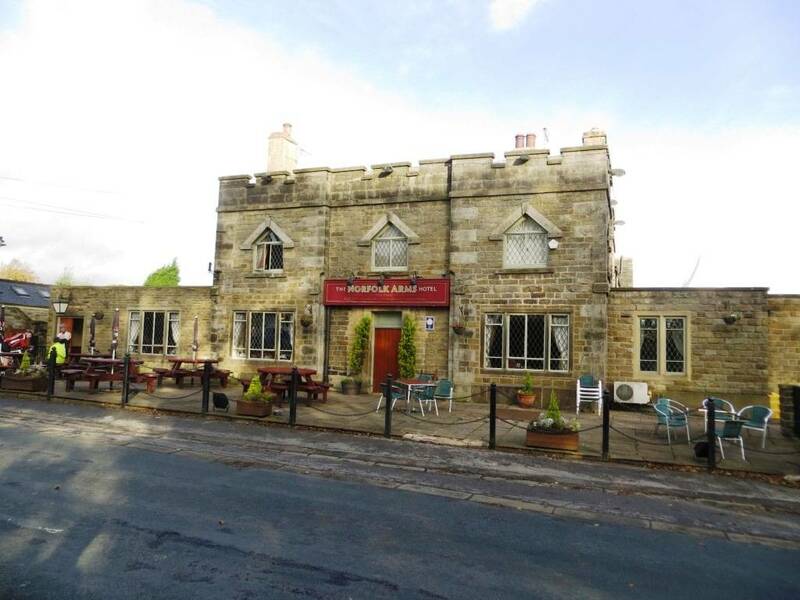 Even before the Industrial Revolution had begun, the villages around Sheffield were established as centres of industry and commerce, utilising the fast-flowing rivers and streams that brought water down from the Peak District. The valleys through which these flowed were ideally suited for man-made dams that could be used to power water mills, the remains of several of which you will see on this walk. 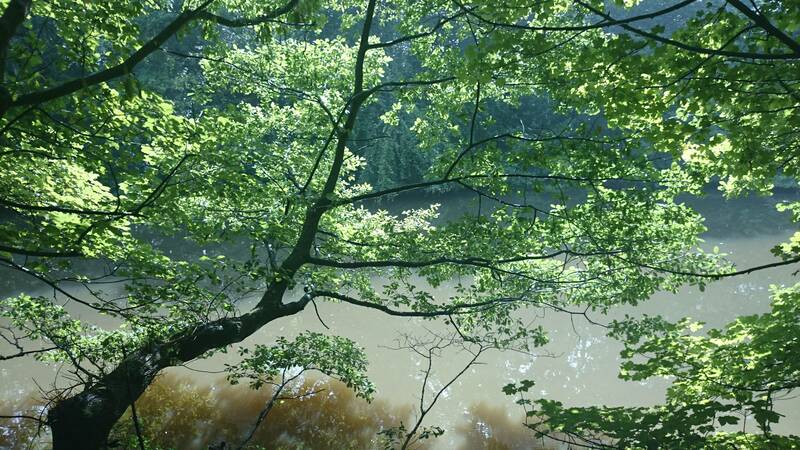 The city centre lies where these rivers and valleys meet. 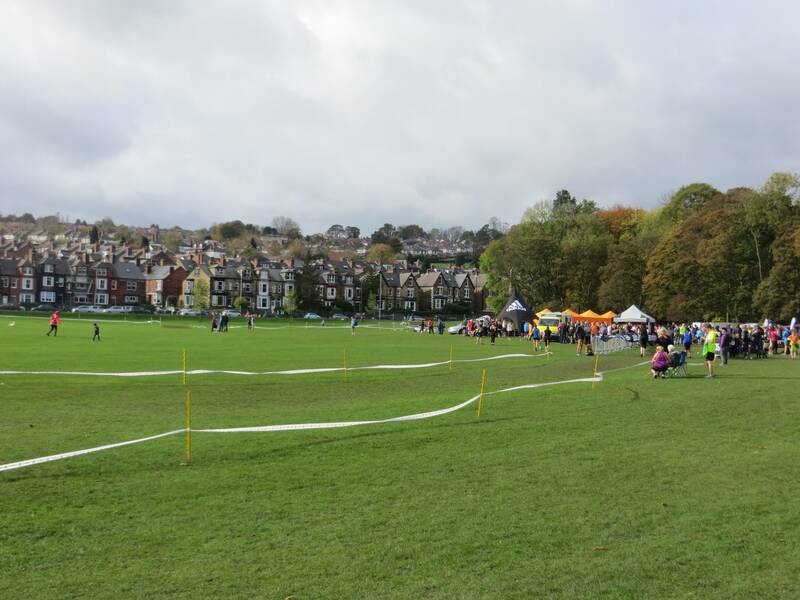 The city has expanded out along and up the valleys and over the hills between, creating leafy neighbourhoods and suburbs within easy reach of the city centre. 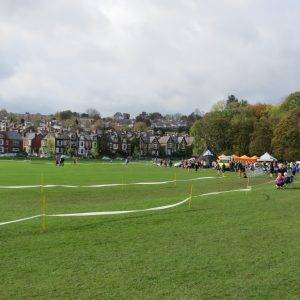 Each valley that stretches out from the city centre has its own character, from the densely industrial Don Valley in the north-east, to the green and cosmopolitan residential streets around the Ecclesall Road on the Porter Valley to the south-west. 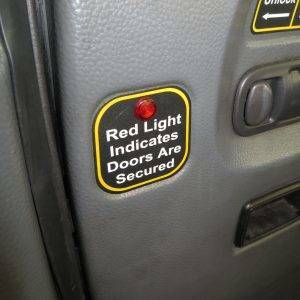 The moment my son and I got into the taxi at Sheffield Station on our way up the hill we were reminded that we were in a city famous for its music. 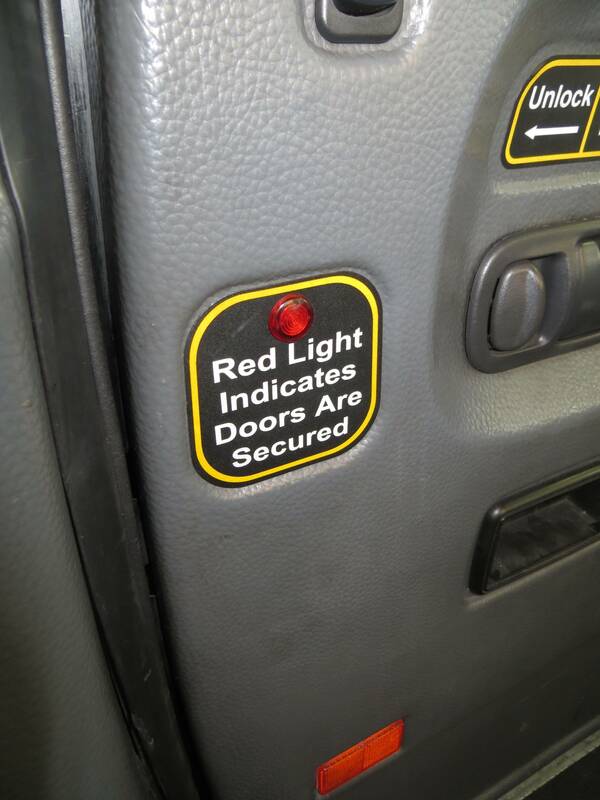 As we pulled away from the rank the light flashed on in the door – ‘Red Light Indicates Doors are Secure’ – he immediately spotted in that the name of a favourite Arctic Monkeys song – but, unlike the protagonists of the song, we were stone cold sober and not clutching takeaways, it being early on a Sunday morning. For us, it was a thermos and sarnies. And our destination was bog pits rather than moshpits. 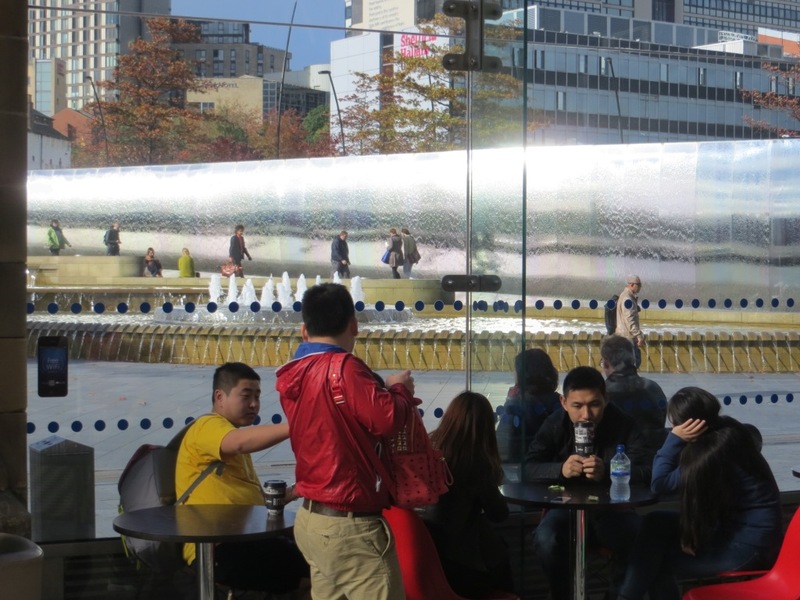 The incredible thing about Sheffield is how quickly you get out of it, which is even more surprising if you consider it’s one of the largest cities in the UK. Within five minutes, we were on the Ringinglow Rd and the ancient taxi was labouring up the hill like a shire horse, one minute huffing past Victorian mansions and the very next minute chugging past sheep and a traditional Peak District Farm, complete with sheepdogs and untidy yard. We alighted at the Norfolk Arms (the taxi driver had never been this far out of the city before, but it had only taken 10 minutes to get here). 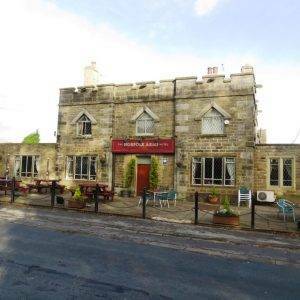 The Norfolk Arms is an old coaching inn, and is now a popular place for walkers to stay, mostly for exploring the Peak District National Park which starts at Ringinglow and stretches many miles to the east. A popular route is the Sheffield Country Walk along nearby Stanage Edge. Unlike most of the walkers who were heading out onto the moor, however, we set out north east along Fulwood Lane to the head of the Porter Brook Valley. 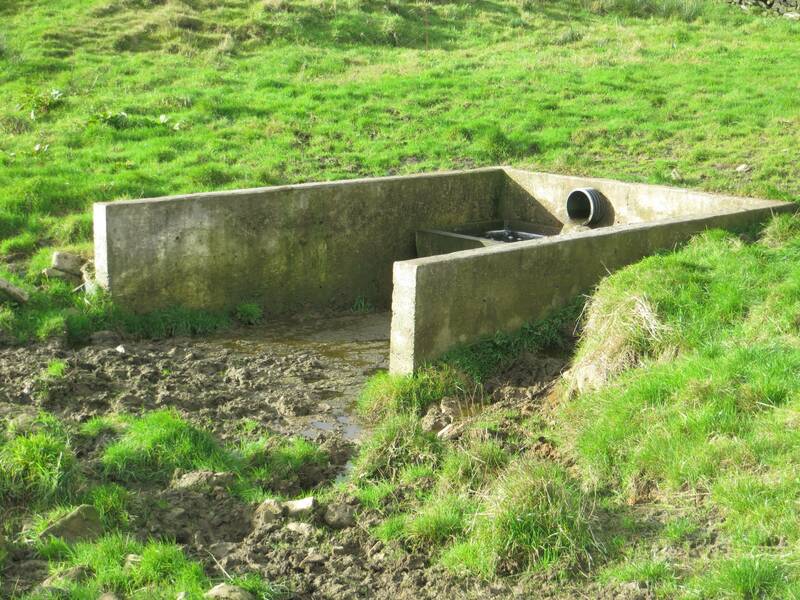 If you are a ‘purist’ and need to see the source of the Porter Brook, then head on past the twist in the road where the stream comes down and take the next left back up a footpath onto the moors. 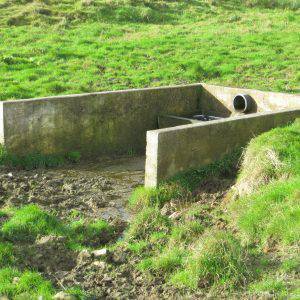 Soon you will see what looks like a glorified cattle trough in a dip, a couple of hundred yards beneath Brown Edge Farm. This is Clough Hollow, the ‘authentic source’; but it’s not as gripping as, say, the source of the Nile, so only go if you feel the need to start at the ‘official’ beginning (we will be guiding you to the ‘absolute’ end). As a bonus, you will get some cracking views of Sheffield. The Porter Brook derives its name from its brownish colour, similar to the colour of Porter beer, a brownish discolouration obtained as it passes over iron-ore deposits on its course from the source. Like the other rivers in Sheffield, the Porter Brook is ideally suited for providing water power, as the final section falls some 450 feet in a little over 4 miles. This enabled dams to be constructed reasonably close together, without the outflow from one mill being restricted by the next downstream dam. By 1740 Sheffield had become the most extensive user of water-power in Britain. Ninety mills had been built, two-thirds of them for grinding. 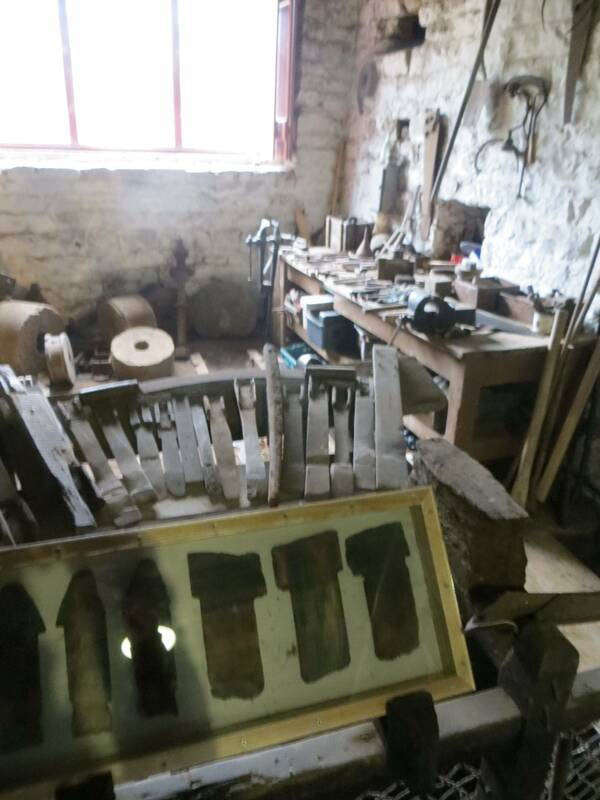 In the Porter Valley alone 21 mill dams served 19 water-wheels, mostly used for grinding corn, operating forge-hammers and rolling mills, grinding knives and the various types of blades that made Sheffield famous. Most were active during the 18th and 19th centuries. 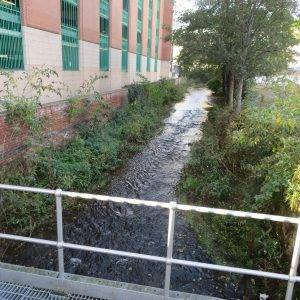 Nowadays, of course, the Porter Brook’s role has changed – it is used to expend energy rather than harness it. During our steady descent, we passed a hundred or more people using it for walking, jogging or cycling; its beauty and freshness giving pleasure to all and an escape from the city, especially on this late autumn day with the leaves turning. 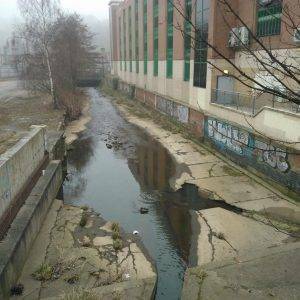 For the Porter Brook is truly a city escape nowadays. It offers the rural idyll of a small, fast flowing stream in a narrow valley, with numerous eddies and oxbows, ancient trees, glimpses of the fields either side and a winding path that looks as if it was created by nature itself. The Friends of the Porter Valley Group was set up in the 1990s with the aim of preserving and enhancing the natural and historical characteristics of the Porter Valley, between Hunters Bar and Porter Clough. Their website shows them to be a very active group. But many remnants of the old heritage features still exist, with some of the flow being held back into man-made lakes that look as though they’ve always been there. The first such spot we came to is Forge Dam. By 1765, it had become a forge and rolling mill, and was subsequently used for the production of saws (Mr Weston’s of Weston Hall perhaps? ), while two drop-hammers were used to beat heated metal ingots into wrought-iron. 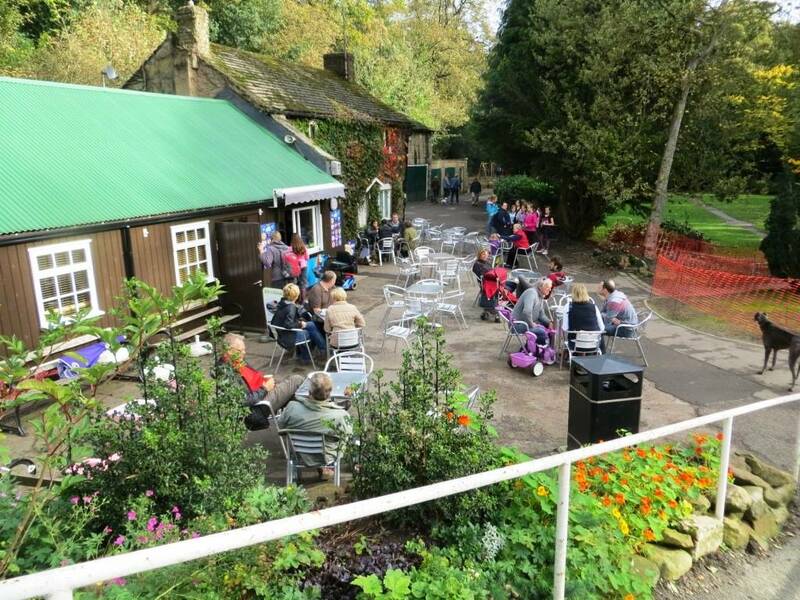 Today the café is a popular spot for Sheffield families walking up the valley or bringing their toddlers to play in the playground there. Everyone it would seem has childhood memories of this spot. 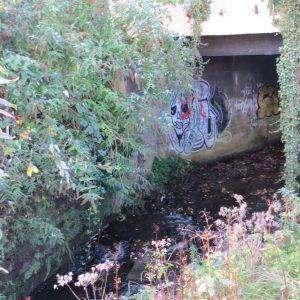 “Just behind the station, before you reach the traffic island, a river runs thru’ a concrete channel. The next piece of industrial heritage we came upon was the Shepherd Wheel, which first started generating power in the 1550s, became derelict in the 20th century and was lovingly restored in the twenty-first by the Friends of the Porter Valley, with Heritage Lottery & Council funding, reopening as a working museum. 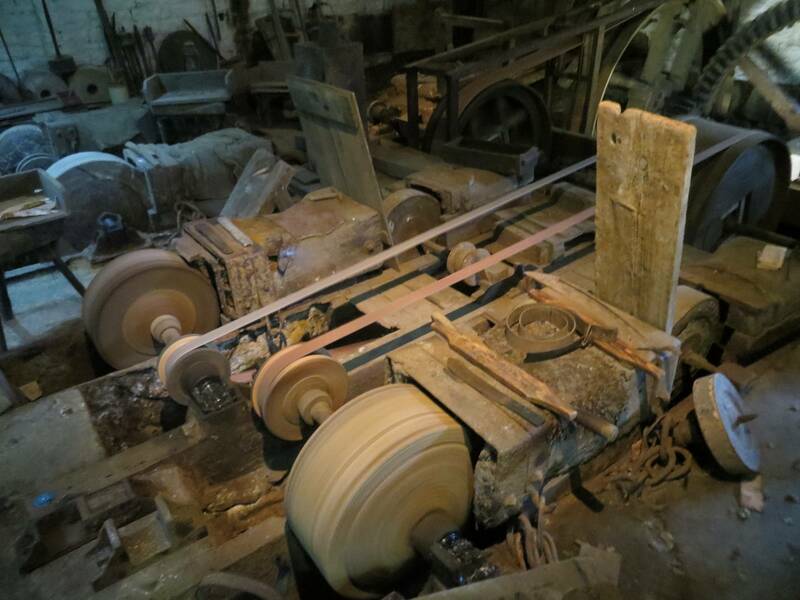 We were left spellbound watching the water feed into the mill wheel , turning the axles, the crown wheel, the pinions, the drums, the belts, the lion shaft, all finally connecting up with the grind stones. The atmosphere today is mellow, with the soft and agreeable rumbling of the wheels; but during its working life there were all sorts of health & safety risks, including silicosis and exploding grindstones, making it a very hazardous place to work. 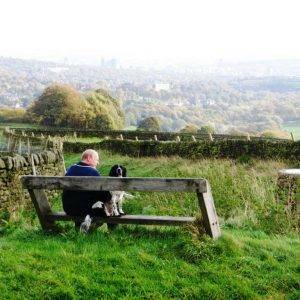 We eventually dragged ourselves away and continued on down to Endcliffe Park (15 hectares, 37 acres). 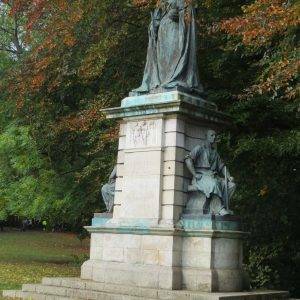 This delightful park was opened in 1887 to commemorate the Jubilee of Queen Victoria. 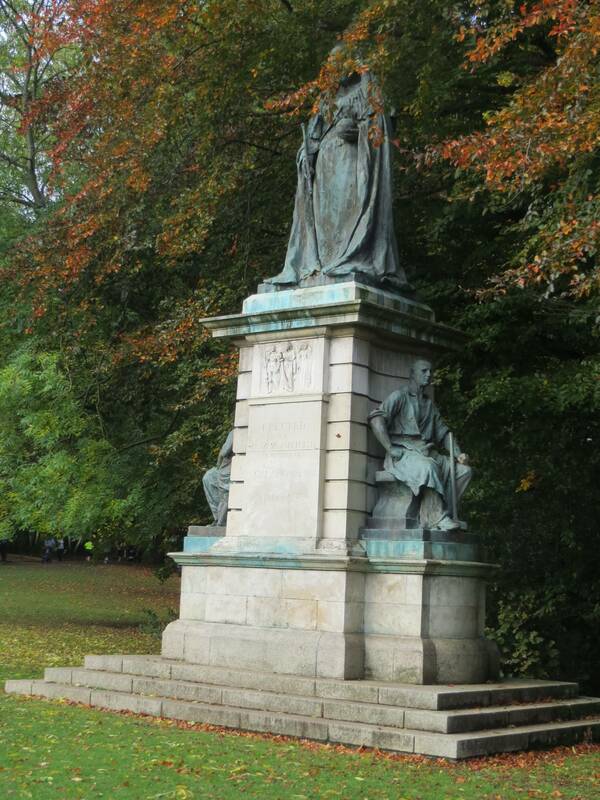 Near the entrance is a statue of her and mid-way up the path towards Whiteley Woods is an obelisk also in honour of her. The park was laid out by William Goldring, a nationally acclaimed park designer, who was responsible for work on nearly 700 different garden landscape projects across England and was in charge of the Herbaceous Department at the Royal Botanic Gardens in Kew. Coming out of the park, my son immediately spotted another Arctic Monkeys reference, a sign saying ‘Hunters Bar’. This is the name of the immediate surrounding area, comprising well-to-do Victorian houses, named after a former toll bar which still stands rather incongruously in the middle of the roundabout immediately in front of us. In the Arctic Monkeys song ‘Fake Tales of San Francisco’ the lyrics dismiss a phoney world of pop wannabees: “He talks of San Francisco, he’s from Hunter’s Bar”. From the Ecclesall Roundabout onwards into the city, the character of the Porter Brook changes substantially as it plays distinctly second fiddle to the urban landscape. 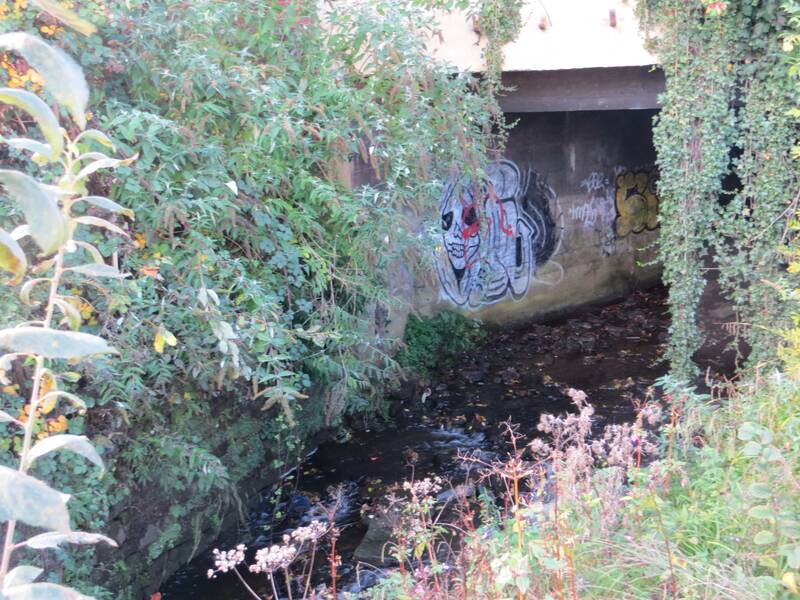 It becomes confined and increasingly culverted as it heads towards the city centre. 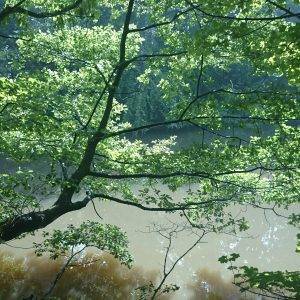 If you enjoy ‘geographic features’ detective work, you will relish the search for it. 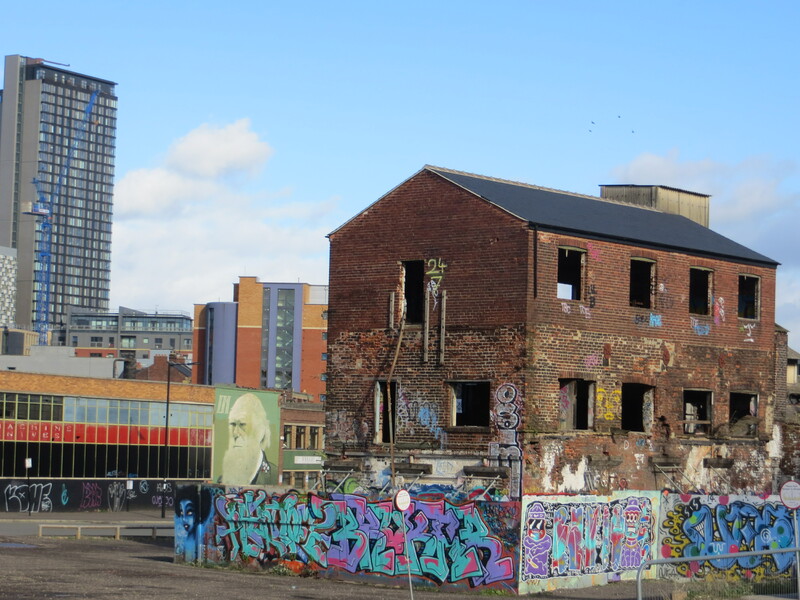 The 1830s saw a wave of philanthropic activity in this part of Sheffield, as newly wealthy non-conformist industrialists sought to make their mark on their rapidly expanding city. Outside the conservative, Anglican, land-owning establishment, these non-conformists were cementing their positions in society. One of the most notable was the Wilson family of Sharrow Mills, just along the road from Hunter’s Bar. They had bought more land in the valley than they needed for their business and sold some of it to help create the Botanical Gardens and General Cemetery. 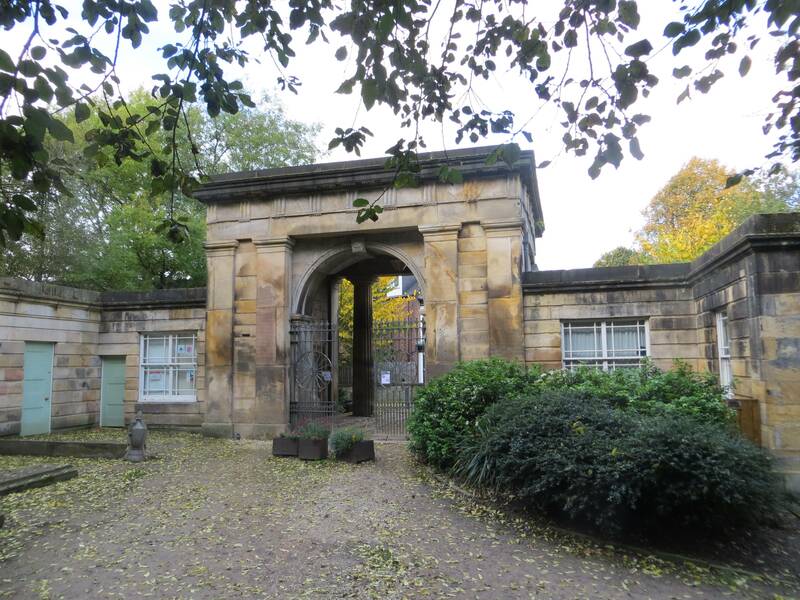 The Sheffield Botanical Gardens (7.7 hectares, 19 acres) were opened in 1836. Originally designed by Robert Marnock in the Gardenesque style, the site now has fifteen different garden areas featuring collections of plants from all over the world, and impressive Grade II* listed curvilinear glass pavilions. 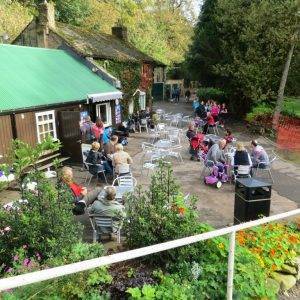 The gardens have recently been fully restored thanks to a £5 million Heritage Lottery Fund Award. Leaving the Botanical Gardens by the SE (Thompson Rd) exit, we could just see Sharrow Mills at the end of Snuff Mill Lane (no access, unfortunately), which has been producing snuff since the 1730s and amazingly is still in operation today, and still producing snuff! And even more amazingly, a descendant of the founding Wilson is still running it (seven generations later). 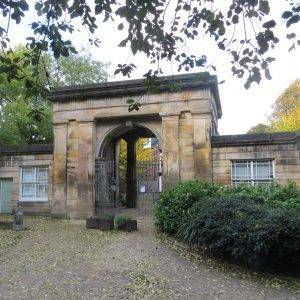 Next, we entered Sheffield General Cemetery (5.5 hectares, 13.6 acres) through the somewhat dilapidated Grade II* Egyptian-style gatehouse which lies directly over the Porter Brook; possibly built over it so that entering the cemetery was symbolic of the crossing of the River Styx in Greek mythology? 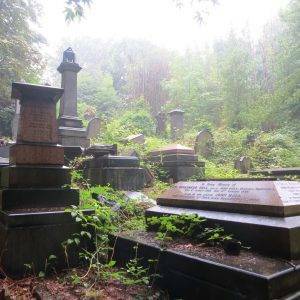 The cemetery was also opened in 1836, in what was then countryside. The graveyards in town were overflowing and there was an urgent need to find more space for the bodies. The Cemetery was intended to be a place where people could be buried in a way that reflected their earthly wealth and status. 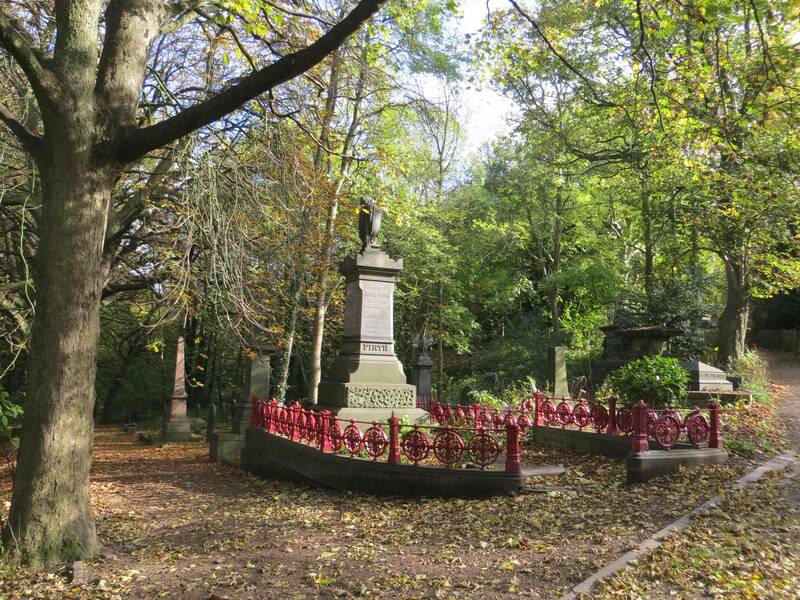 It became established as the principal burial ground in Victorian Sheffield containing the graves of 87,000 people. But it was also intended as a place for the living. It has sweeping vistas and inspiring architecture – the grand scheme celebrated the designer’s attitudes towards life (Robert Marnock was the landscape adviser). 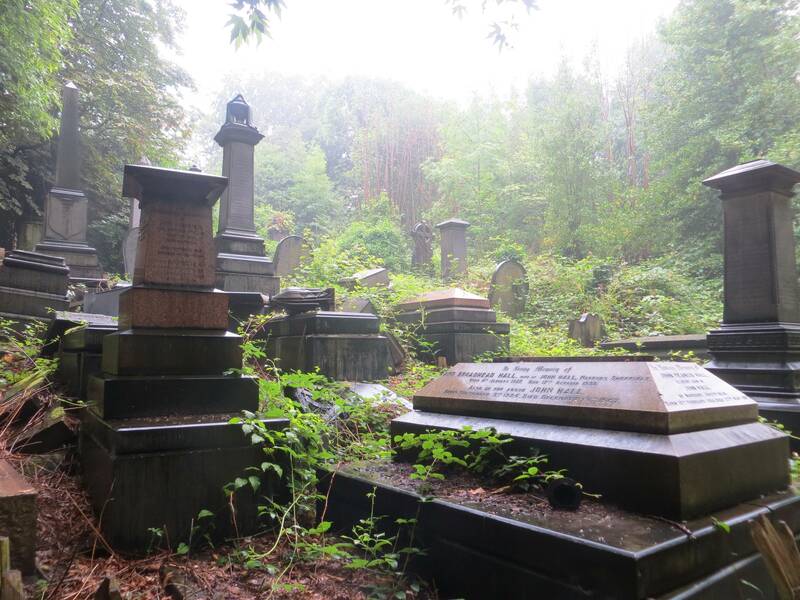 The cemetery was one of the first in Britain to promote this type of landscape, with the purpose of creating an uplifting outlook, in which people could contemplate the beauty and tranquillity of their surroundings. Heading up to the higher ground to the right of the path we got this sense immediately. 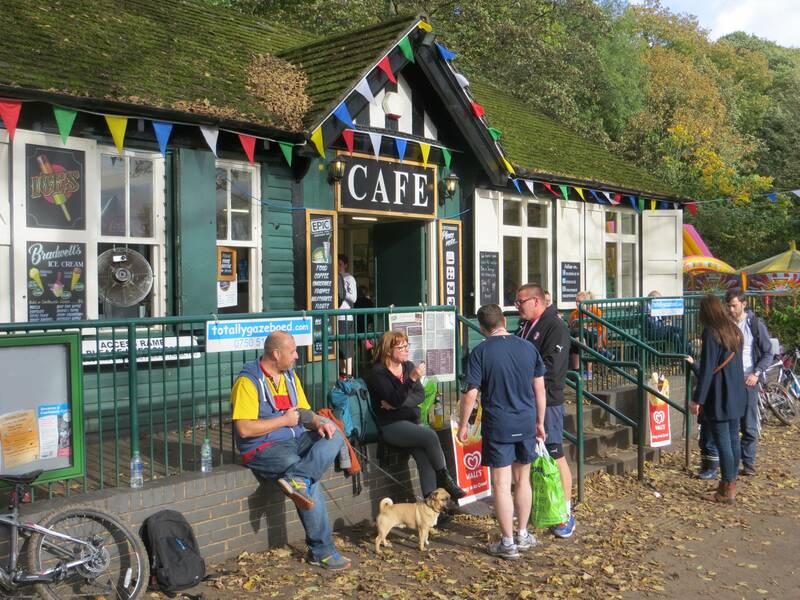 The site today is listed Grade II* and is a Conservation Area, Local Nature Reserve and Area of Natural History Interest. 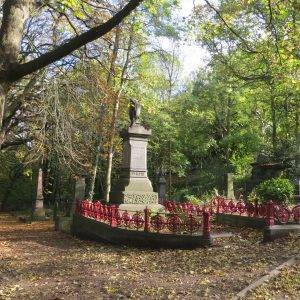 It is also the resting place of many important figures in Sheffield history such as Mark Firth, the steel manufacturer, and Samuel Holberry, the Chartist. The Cemetery was only closed for burial in 1978 when half of it was demolished to make way for a green space (the second part of our walk). 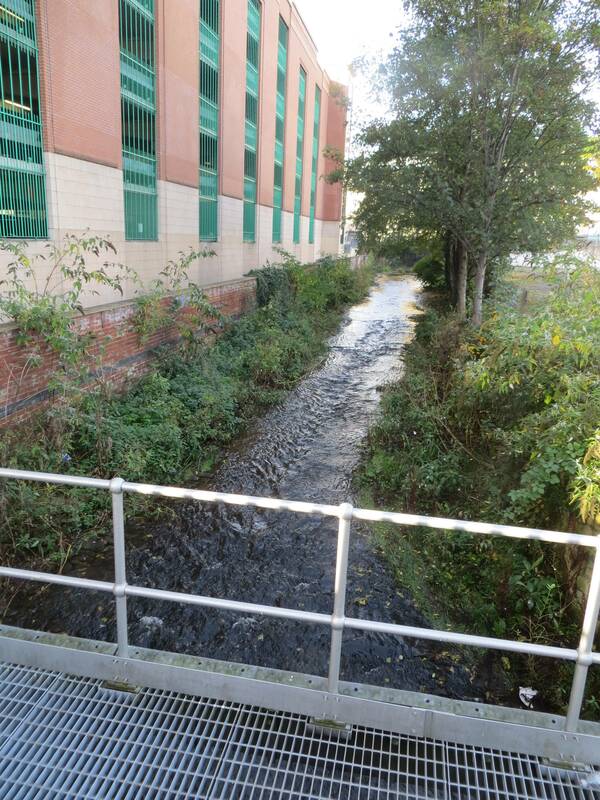 We got three significant final glimpses of the brook as it becomes more culverted, modified and neglected. 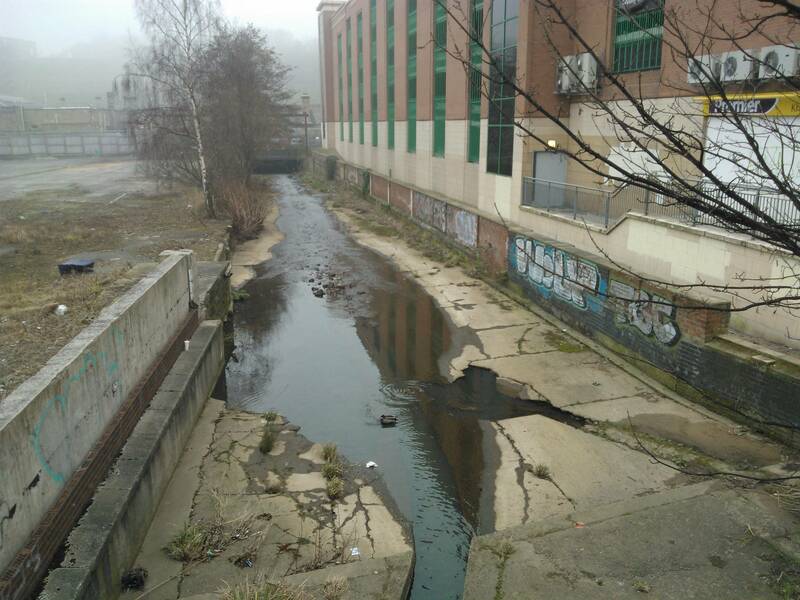 To the citizens of Sheffield, the Porter Brook is a hidden, forgotten stream, hard to recognise from its natural beginnings in the countryside (where we had been only a couple of hours earlier), seemingly devoid of life and interest, a place that attracts rubbish and pollution. It is only really noticed when it floods occasionally. Our last sightings: as we passed down Mary St, just to the left of the road, with a view across a deserted car park and a derelict cutlery factory. Then going under the road in Matilda St, and finally just alongside the car park on the south side of the station, before it finally enters a culvert. How many people have stood on Platform 5 of the station, not realising that Sheffield’s Porter Brook joins with the flow of the River Sheaf in the darkness below, the station elevated above the water on stone Victorian pillars, in a culvert called the ‘Megatron’ – a culvert so large and impressive, it has featured on a list of most impressive caves in the world? And so our journey ends at the ‘Cutting Edge’ water feature at the station entrance – the flow of which, at least in my mind, must be that of the Porter Brook which passes so close by. What a totally satisfactory completion of our journey. Shortly take a left into Hereford St and then a right into Mary St, along which you will see the Porter Brook running once again; turn left into Shoreham St, passing Matilda St on your left (under which the Porter Brook flows); then when you get to the cinema in Shoreham St, turn right down to the station and once again (and for the final time) you will see the Porter Brook culvert. 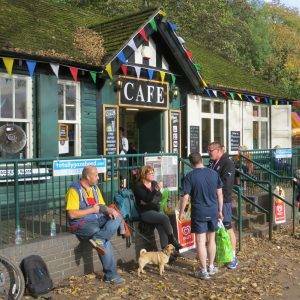 Forge Dam Café, Carr Forge Dam, S10 4GN (Tel: 0114 221 1900, www.forgedamcafe.com/about-2) for over 80 years, this café has been a well-loved spot for walkers and cyclists. (Tel: 0114 268 3674, www.homemade-sheffield.co.uk) original, fun and friendly. 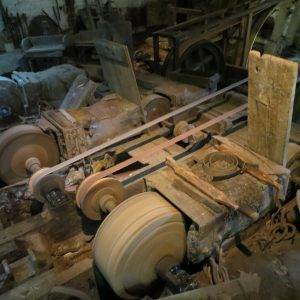 Shepherd Wheel Open Sat & Sun only, run by volunteers, free admission. A great insight into early industrialisation.